A host of serious medical problems put Ron Hale on a downward spiral of deteriorating health. But a liver and a kidney transplant at Mayo Clinic stopped Ron's decline and dramatically improved his quality of life. Diagnosed with cirrhosis in March 2013, Ron Hale spent several long years coping with declining health and frequent hospitalizations. By December 2016, Ron was in an intensive care unit in critical condition at Mayo Clinic's Florida campus waiting for a liver transplant and kidney transplant. The future looked bleak. "They had him on continuous dialysis. He was on a respirator with a tracheostomy," says Ron's wife, Patricia. "I was watching him go downhill so very fast." But then, she adds, came "a Christmas miracle." A liver and a kidney became available for Ron, and successful transplants would change his outlook completely and leave Ron feeling good again, allowing the couple to celebrate their 44th wedding anniversary in June. For his renewed health, Ron is happy to give credit to his care team at Mayo Clinic. "I know I'm in really good hands when I go to Mayo. It's the best hospital in the country," Ron says. "Before I had the transplants, I didn't think I was going to make it through the year. Now I'm ready to tackle the world." After he found out he had cirrhosis, Ron spent most of the year in and out of the hospital in Riverside, California, where he lived at the time. He was on dialysis for kidney failure, and he needed several blood transfusions. He also required frequent treatment for hepatic encephalopathy — mental fogginess that can develop when toxins the liver should normally filter enter the body's main bloodstream. Doctors told Ron he needed a new liver. But when he was added to the national transplant waiting list in August 2015, physicians in California informed the Hales that the wait would likely be a long one. The couple began researching their options. After finding wait times for an organ in Florida might be shorter, they moved to a suburb of Tampa. In 2016, Ron continued to be in and out of the hospital. In one frightening episode, he ended up in a coma from a ruptured femoral artery. As his health continued to deteriorate, a local nephrologist recommended Ron go to Mayo Clinic for a kidney transplant evaluation. The Hales drove to Jacksonville on Nov. 28, 2016. Ron was hospitalized on arrival as he continued to be plagued with hepatic encephalopathy. Ron was added to the transplant list a few days before Christmas, but he remained in the ICU in critical condition. Patricia says she will never forget spending Christmas Eve sharing pizza with the ICU doctors and the care and compassion she and her husband received. "I've hugged more doctors in the last few months than in my entire lifetime," she says. On Dec. 28, doctors told Patricia they had found a liver and a kidney for her husband. Ron went into surgery that night. The procedures were successful, and Ron was discharged from the hospital a few weeks later. Since then, his health has improved dramatically. 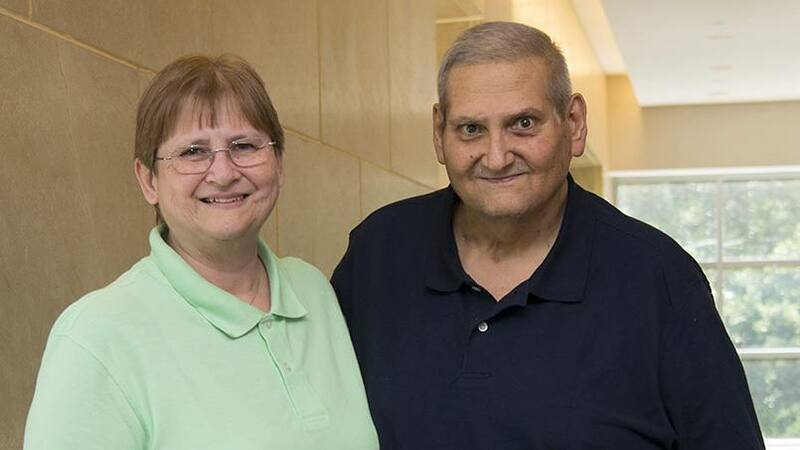 For Patricia the care both she and Ron received at Mayo Clinic is something she'll never forget. "Everybody cares about you, not just the patient but the family, too," Patricia says. "They explain everything in a way that you can understand it. I can't say enough good things about Mayo." Learn more about liver transplants and kidney transplants.